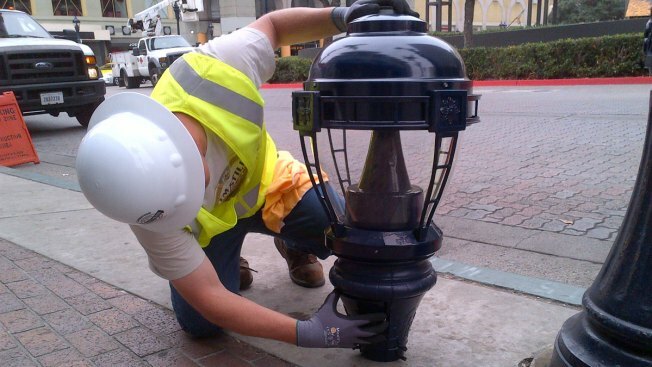 Thousands of street lights in downtown San Diego will be replaced over the next several weeks. Thousands of street lights in downtown San Diego will be replaced as part of a new "smart street lighting system." The new lamps with LED lights use a smart, wireless technology that allows the city to control each individual light on any street. City officials said state and federal loans and grants along with SDG&E rebate funds are being used for the project and that the new lamps will eventually pay for themselves with energy savings. San Diego will save more than $250,000 a year from the project that will cost $5.3 million to implement, officials said. That cost breaks down to approximately $1,800 per lamp. The project manager told NBC 7 some pedestrian lamps typically cost about $1,000 more than a utility light. Reaction from residents on the street was mixed. "I mean yeah, it's great that they're replacing the city lights but at the same time they should be more worried about homeless," said resident Jen Williams. The replacement of all lamps will be complete by late spring 2014.